With age, characteristic changes occur in the central third of the face. A youthful midface is characterized by prominent cheeks and a smooth transition between the lower eyelid and cheek. Structural, soft tissue, and skin changes develop as wrinkles and creases, progressive ptosis, and general atrophy of the structures. Pessa confirmed the changes seen in the bony structures of the face, and these include a downward migration of cephalometric points. The downward migration manifests as a change in soft tissue volume. The effects of gravity and repeated animation of the face also directly affect the soft tissue that overlies the mimetic musculature. The results of magnetic resonance imaging (MRI) evaluations have helped to determine that the mimetic muscles themselves remain intact; however, the attachment to the overlying soft tissue and skin changes. The repeated action of smiling results in deepening of the nasolabial fold at the point at which the superficial musculoaponeurotic system (SMAS) inserts into the dermis. The facial nerve exits the skull just inferior to the tragus of the ear. (See the image below.) The proximal branches course deep to the superficial musculoaponeurotic system (SMAS). The frontal branch extends along a line 0.5 cm below the tragus to 1.5 cm above the lateral brow and becomes more superficial at the level of the zygoma. The frontal branch has little cross-innervation compared with the buccal and zygomatic branches of the facial nerve. Unlike the cervical branch, it transitions from a deep plane to a more superficial plane. The great auricular nerve is a sensory branch. Facelift anatomy. Cadaver dissection demonstrating the course of the facial nerve in the plane below the superficial musculoaponeurotic system. The buccal and zygomatic branches pass deep to the SMAS within the parotid gland until the terminal branches pass superficially to innervate the mimetic muscles anterior to the parotid gland. The mandibular branch usually remains superior to the inferior border of the mandible until it reaches the facial artery crossing the mandibular margin. The terminal branches distal to the facial artery are uniformly inferior to the mandibular border. In a youthful midface, the malar fat pad (outlined in the image below) is located over the zygomatic bone. The triangular pad lies along the edge of the nasolabial fold. Its upper border covers the orbital rim and the orbital part of the orbicularis oculi. The lateral border can be identified by drawing a perpendicular line from the lateral canthus down to the triangular apex of the malar fat pad. The malar fat pad is located beneath the skin and subcutaneous fat, but it is superficial to the SMAS and has little significant structural attachment to it. The malar fat pad is fibrous and fatty and is readily distinguishable from the overlying subcutaneous fat. Facelift anatomy. Lateral view of a cadaver dissection outlining the malar fat pad border and the lateral border of the superficial musculoaponeurotic system. With advancing age, the malar fat pad slides downward and slightly forward, over the SMAS. Over time, gravity pulls the malar fat pad down off the zygomatic arch and the orbicularis oculi muscle. Because of the malar fat pad's tight adherence to the skin but loose connection to the SMAS, it translocates along the surface of the SMAS to ultimately reside inferior and medial to its prior position. It bulges against the fixed nasolabial crease and creates the illusion of deepening it. The corner of the mouth droops, and the commissure develops a downward orientation. To a lesser extent, this displacement also results in the formation of labiomandibular folds (so-called marionette lines) and jowls. Proper surgical rejuvenation of the face restores the original anatomy and therefore allows a younger, natural appearance that reflects the person's appearance prior to the extended effects of gravity. The vertical repositioning of the malar fat pad is key to restoring a youthful appearance in the adult face. When assessing the midface for rejuvenation potential, evaluating the lower eyelid and periorbital region is important. Of particular importance is evaluation of the amount of excess skin and periorbital fat herniation. To correct the tissue that has been displaced from the lower lid region, lower blepharoplasty is performed in conjunction with midface rejuvenation. For this, a small skin-muscle flap is removed from the area extending to the lateral canthus. After removal of at most a minimal amount of fat (sometimes, no fat is removed), a clear 4-0 nylon suture is used to tighten and suspend the preseptal orbicularis oculi muscle. This allows correction of periorbital fatty herniation without the need for aggressive resection, which can lead to hollowing of the orbit. In addition, it tightens the lower lid and reduces the risk of lower lid ectropion. Frost sutures are also used during the first 24 hours to reduce the risk of ectropion. Facelift anatomy. Cadaver dissection of the superficial musculoaponeurotic system. The temporal region the SMAS is described as having 2 layers where it transitions into the superficial temporal fascia or temporalis fascia. Deep to the temporal region of the SMAS lies the superficial temporal artery and frontal branch of the facial nerve. The SMAS invests the superficial mimetic muscles, including the platysma muscle, orbicularis oculi muscle, occipitofrontalis muscle, zygomatici muscles, and levator labii superioris muscle. It attaches to the skin via ligamentous extensions and is thicker and more distinctly developed at the zygomaticus major muscle. Sharp dissection performed at the level of the parotid fascia frees up a plane above the deep facial fascia, thereby protecting the facial nerve. Full mobilization of the SMAS can be achieved starting 2-3 cm anterior to the pretragal crease, in front of the anterior border of the masseter muscle. Some reports indicate that the SMAS layer can be elevated as far medial as the nasolabial fold. The SMAS can also be repositioned, partially excised, or plicated as needed to further augment or contour the elevation of the malar fat pad. The platysma is invested into the inferior extent of the SMAS. Fat superficial to the platysma can be liposuctioned or directly excised. The platysma can be plicated, suspended with sutures, or even partially excised, as needed, to further define the proper mandibular-neck angle. 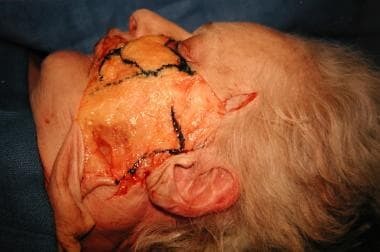 The authors' preferred technique for facelifts uses a prehairline incision and subcutaneous dissection plane. The procedure is performed with the patient under general anesthesia. After infiltration with 0.5% lidocaine (Xylocaine) and 1:200,000 epinephrine, the initial incision is made starting 1.5 cm above the lateral eyebrow. This incision is continued in front of the sideburn. It is then continued behind the ear at the level of the tragus after following the earlobe. This approach also allows for excision of a transverse wedge above the ear at the conclusion of the procedure. 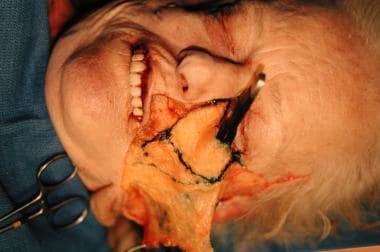 Dissection is performed in the subcutaneous plane, superficial to the SMAS and well away from the branches of the facial nerve. The end points of this dissection are critical to the ultimate outcome of the procedure. Superiorly, the dissection should not extend past the lateral eyebrow. Inferiorly, the limit is variable and must be adjusted to account for soft tissue sagging. The inferior area is tapered down to the mandibular-nasal-canthal intersection point. This point is located by drawing a vertical line down from the lateral canthus and a horizontal line across from the base of the nose. Dissection performed past this point risks disrupting the connections between the malar fat pad and the nasolabial fold. The depth of dissection should be rather superficial in some areas. These include the areas above the lateral portion of the malar fat pad and above the orbicularis oculi muscle. When proper exposure of the malar fat pad has been accomplished, 2 Allis clamps are used to grasp the pad and elevate it from the edge of the zygoma (see the image below). Repositioning can then be accomplished such that the nasolabial fold is reduced, the jowls are raised, and the corner of the mouth is elevated. Vertical nylon sutures in the superficial temporal fascia at the level of the eyebrows secure the pad in the desired position. Facelift anatomy. Cadaver dissection demonstrating the malar fat pad elevated in the subperiosteal plane. An alternative approach using the same planes of dissection is available through the lower blepharoplasty incision. This approach, while reliable, limits the skin resection and provides a less dramatic elevation of the malar fat pad. Yousif NJ. Changes of the midface with age. Clin Plast Surg. 1995 Apr. 22(2):213-26. [Medline]. Pessa JE. An algorithm of facial aging: verification of Lambros's theory by three-dimensional stereolithography, with reference to the pathogenesis of midfacial aging, scleral show, and the lateral suborbital trough deformity. Plast Reconstr Surg. 2000 Aug. 106(2):479-88; discussion 489-90. [Medline]. Blanco-Dávila F, Arrendondo G, De La Garza O, Montemayor R, Gregori OU, Vásconez HC. Anatomical study of the blood supply to the skin in rhytidectomy. Aesthetic Plast Surg. 1995 Mar-Apr. 19(2):175-81. [Medline]. Narasimhan K, Stuzin JM, Rohrich RJ. Five-step neck lift: integrating anatomy with clinical practice to optimize results. Plast Reconstr Surg. 2013 Aug. 132(2):339-50. [Medline]. Gruber RP, Levine SM, Levine JP. Facial topography: clinical anatomy of the face. Plast Reconstr Surg. 2013 Jul. 132(1):249. [Medline]. Hwang K, Han JY, Chung RS, Chung IH. Submental perforating artery: a culprit of bleeding during facelift. J Craniofac Surg. 2005 Jan. 16(1):3-5. [Medline]. Lefkowitz T, Hazani R, Chowdhry S, Elston J, Yaremchuk MJ, Wilhelmi BJ. 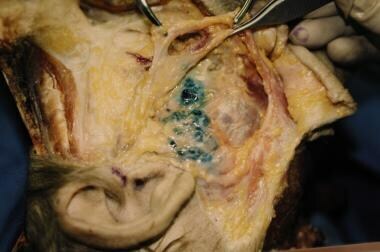 Anatomical landmarks to avoid injury to the great auricular nerve during rhytidectomy. Aesthet Surg J. 2013 Jan. 33(1):19-23. [Medline]. Graf R, Groth AK, Pace D, Neto LG. Facial rejuvenation with SMASectomy and FAME using vertical vectors. Aesthetic Plast Surg. 2008 Jul. 32(4):585-92. [Medline]. De Cordier BC, de la Torre JI, Al-Hakeem MS, Rosenberg LZ, Costa-Ferreira A, Gardner PM, et al. Rejuvenation of the midface by elevating the malar fat pad: review of technique, cases, and complications. Plast Reconstr Surg. 2002 Nov. 110(6):1526-36; discussion 1537-40. [Medline]. Gamboa GM, de la Torre JI, Vasconez LO. Surgical anatomy of the midface as applied to facial rejuvenation. Ann Plast Surg. 2004 Mar. 52(3):240-5. [Medline]. Rohrich RJ, Pessa JE. The retaining system of the face: histologic evaluation of the septal boundaries of the subcutaneous fat compartments. Plast Reconstr Surg. 2008 May. 121(5):1804-9. [Medline]. The authors and editors gratefully acknowledge the contributions of previous authors Peter D Ray, MD, and Luis O Vasconez, MD, FACS, to the development and writing of this article.